Contains honey and royal jelly. Honey helps firm your skin, stimulates cell regeneration, increases blood circulation and also has sanitizing and calming effect. Honey contains sugar, glucose, proteins, vitamin B1, B6, C and etc... The Zine and Magnesium in it makes your skin look radiant. 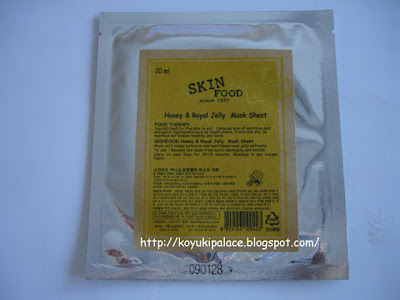 The sheet mask contains a lot of royal jelly essence, I put it on for 30 mins and the next day my skin is so soft!! I just love royal jelly, it feels so natural!